Home Mayon Volcano PHIVOLCS MAYON VOLCANO BULLETIN 26 June 2018. MAYON VOLCANO BULLETIN 26 June 2018. MAYON VOLCANO BULLETIN 26 June 2018 08:00 A.M.
Mayon Volcano’s seismic monitoring network recorded one (1) volcanic earthquake during the past 24 hours. Moderate emission of white steam-laden plumes that rose 1000 meters from the summit before drifting south-southeast and southwest was observed during the day. Fair crater glow from the summit could be observed at night. Sulfur dioxide (SO2) emission was measured at an average of 1287 tonnes/day on 20 June 2018. 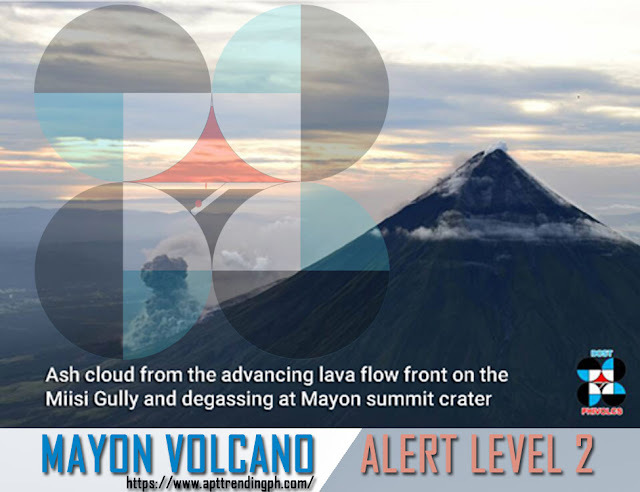 Alert Level 2 currently prevails over Mayon Volcano. This means that Mayon is at a moderate level of unrest. DOST-PHIVOLCS reminds the public that sudden explosions, lava collapses, pyroclastic density currents or PDCs and ashfall can still occur and threaten areas in the upper to middle slopes of Mayon. DOST-PHIVOLCS recommends that entry into the six kilometer-radius Permanent Danger Zone or PDZ and a precautionary seven kilometer-radius Extended Danger Zone or EDZ in the south-southwest to east-northeast sector, stretching from Anoling, Camalig to Sta. Misericordia, Sto. Domingo must be strictly prohibited.